Reference number for this case: 24-Sep-54-Grenoble. Thank you for including this reference number in any correspondence with me regarding this case. 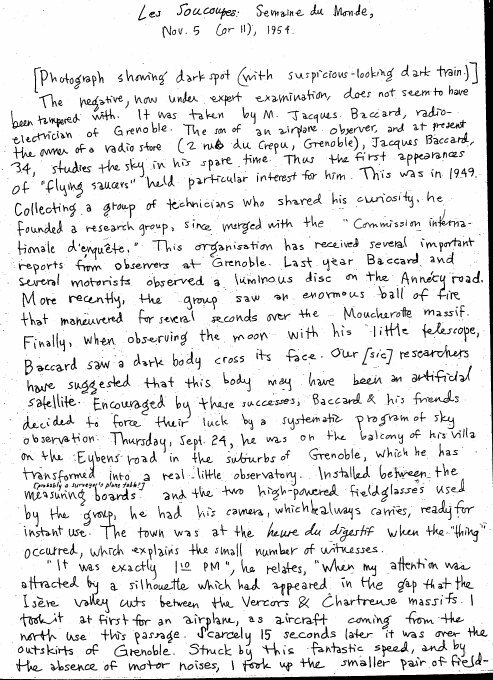 An prominent Grenoble-based electrical engineer, Mr. Baccard, correspondent of the "Uranos" [sic, "Ouranos"] society, a private body whose role it is to collate the testimonies gathered on the "flying saucers", noticed that strange lights rose from a precise spots, several times a week in the sky, forming the horizon of the visual field of his [misprint in the French version, a mis of the words for windows and planets]. The negative, now under expert examination, does not seem to have been tampered with. It was taken by M. Jacques Baccard, radio-electrician of Grenoble. The son of an airplane observer, and at present the owner of a radio store (2 rue du Crepu, Grenoble), Jacques Baccard, 34, studies the sky in his spare time. Thus the first appearances of "flying saucers" held particular interest for him. This was in 1949. Collecting a group of technicians who shared his curiosity, he founded a research group, since merged into the "Commission internationale d'enquête." This organization has received several important reports from observers at Grenoble. Last year Baccard and several motorists observed a luminous disc on the Annecy road. More recently, the group saw an enormous ball of fire that maneuvered for several seconds over the Moucherotte massif. finally, when observing the moon with his little telescope, Baccard saw a dark body cross its face. Our (sic) researchers have suggested that this body may have been an articifial satellite. Encouraged by these successes, Baccard and his friends decided to force their luck by a systematic program of sky observation. Installed between the measuring boards and the two high-powered fieldglasses used by the group, he had his camera, which he always carries, ready for instant use. The town was at the heure du digestif when the "thing" occurred, which explains the small number of witnesses. "It was exactly 1.10 PM", he relates, "when my attention was attracted by a silhouette which had appeared in the gap that the Isère valley cuts between the Vercors and Chartreuse massifs. Radar, October 31: Testomony of Mr. Jacques Baccard, member of the Comité d'Etude and regional correspondent of the C.I.E. OURANOS, president of the Centre de Recherches Scientifiques. Observation de Déret. - Divers. The author reproduces the picture, indicating that it was unretouched, and taken near Grenoble on September 24, 1954. Semaine du Monde (Paris), Nov. 5: The saucers (observation of Mr. Jacques Baccard, president of the Centre des Recherches Scientifiques and the Groupe régional d'étude OURANOS, of Grenoble; with photo of Sept. 24. - Article by Lt Plantier). 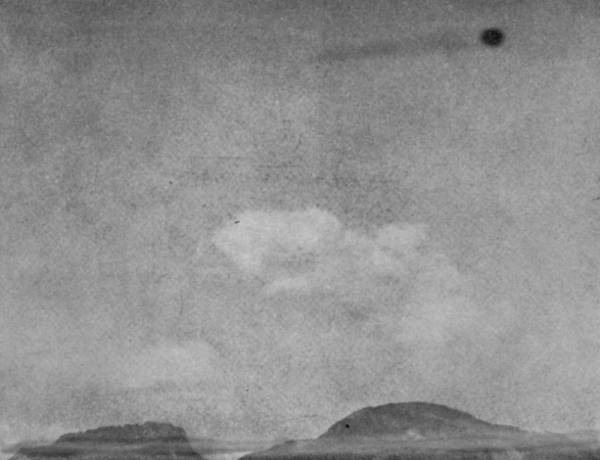 Jimmy Guieu reports that on September 24, 1954, one of the investigators of his own UFO research group finally managed not only observe but also to photograph a flying saucer above Grenoble. The photographer was Mr. Jacques Baccard, engineer and specialist in electronics, director of the Grenoble Ouranos Study Group and its Scientific Research center whom had developed the first magnetic detector especially designed for "the automatic detection of the flying saucers." It was exactly 13h10, when my glances were attracted by a silhouette which had just appeared in perforated that the valley of Isère digs at the exit of Grenoble, between the solid mass of Vercors [mountains] and that of Chartreuse. First of all, I mistook the thing for a plane. This passage is indeed that which the airplane use when coming from the North to approach the airfield in Grenoble. Fifteen seconds had hardly passed that already the machine arrived at the accesses of Grenoble. Intrigued by this fantastic speed, just as by the fact that this displacement was accompanied by no engine noise, I directed the smallest of my of observation binoculars at it. At the same time, the machine which was then above the city marked an abrupt acceleration followed by a strong luminous release of light similar to an electric flash. Moreover, it left a clear, darker gray trail in its axis, and slightly luminous part on the edges, behind it. Having called my mother and my wife near me, I held the apparatus in the field of my binoculars (enlargement x20) during ten seconds. Its shape, which appeared to me in perspective like that for a spindle or of a cigar was actually that of a disc becoming slightly ovoid at its back and comprising in its miffle a kind of spherical fuselage whose two hemispheres were evenly distributed on both sides of the disc's plane. Around this part in the middle, a luminous halation of strong intensity made the contours blurred from there. The body of the machine was of a very dark metal gray and its periphery of a fluorescent white. Seeing that the flying saucer which now flew above Grenoble started a turn in the direction of La Chartreuse, I gave up my observation then and seized my camera to take a snapshot which was carried out with 200th of a second exposure. A few moments later, the machine rose vertically, in a striking down acceleration. It took approximately 6 to 7 seconds to disappear from our sight. According to my calculations, the diameter of the machine was approximately 80 meters (evaluated by comparative measurement); I evaluated its distance as of 2 kilometers; its altitude from 1.000 to 1.200 meters. Length of the contrail: approximately 900 meters (contrail probably due to the condensation of the air in ionized medium). Speed of the machine during its vertical rise: 7 times that of a supersonic plane. It should be noted that it is precisely at the time of its strong deceleration that the long trail appeared! This fact alone is incompatible with the assumption of a jet propulsion. 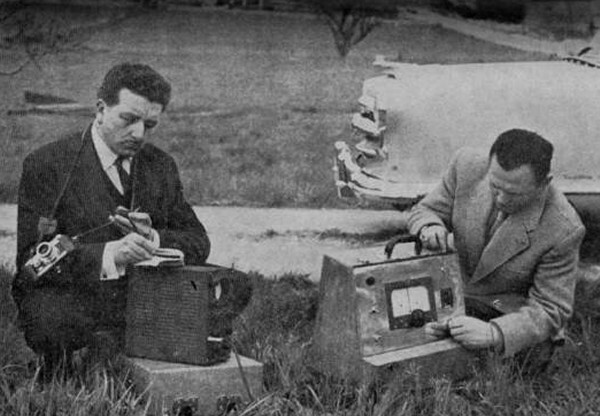 Above: The picture shows Jimmy Guieu on the left and Jacques Baccard on the right, testing "a magnetic detecter reacting to the passage of flying saucers" built by Baccard. 0092; 1954: September 24th Time: unnoted. A black sphere trailing smoke. (photographer unnamed). Refs: Wilkins, 1956, pl. opp.p.65. While browsing his documentation to check the cases alloted to the September 24 of 1954 that presumedly formed an line with Bayonne and Vichy as reference points, Michel Jeantheau checks on a case that Jacques Vallée indicated as of September 24, 1954 in Grenoble. He finds out about the case in the newspaper "Le Parisien Libéré", for September 30, 1954. The photographs sees hom skeptical since it does not fit the visual description. He notes further that Mr. Baccard was alone with only two family members in the center of a town. 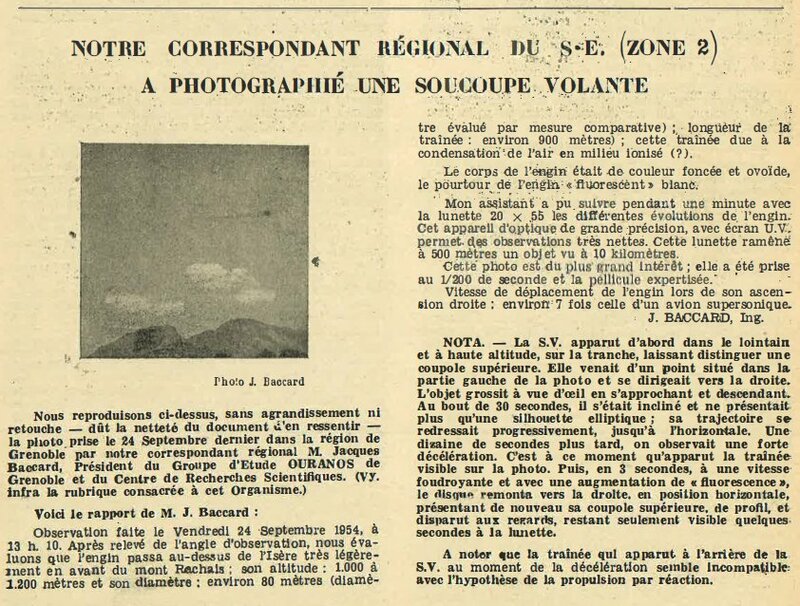 The Belgian ufologist indicates that in 1954, on September 24 in France, in the area of Grenoble "At 13:10 Jacques Baccard succeeds in photographing a UFO." The source is indicated as "Jimmy GUIEU: 'Black-out sur les S.V.' - Fleuve Noir 1956 - p. 146". Luc Chastan indicates that in the Isère in Grenoble on September 24, 1954 at 13:10 hours "It was exactly 13:10, when my glances were attracted by a silhouette which had just appeared in the opening of the valley of the Isère at the exit of Grenoble, between Mount Vercors and that of Chartreuse. Initially, I took the thing for a plane. This passage is indeed the one planes coming from the North use to approach the Grenoble field." "Fifteen seconds had hardly passed when the craft already arrived at the accesses of Grenoble. Intrigued by this fantastic speed, as well as by the fact that this displacement was accompanied by no engine noise, I pointed the smallest of my observation glasses. At the same time, the craft which was then above the city marked a sudden acceleration followed by a strong luminous release similar to the light of an electric arc. Moreover, it left behind a clear, darker gray trail in its axial, and slightly luminous part on the edges." "Having called my mother and my wife near me, I held during ten seconds the craft in the field of my glasses (power 20). Its shape, which appeared to me in perspective like that for a spindle or of a cigar was actually that of a disc becoming slightly ovoid backwards and comprising in its middle a kind of fuselage spherical whose two hemispheres were also distributed on both sides of the disc's plan. Around this one, a luminous halation of strong intensity produced vague contours. The body of the craft was of a very dark metal gray and its periphery of a fluorescent white." "Seeing that the flying saucer which flew over Grenoble now started a turn in direction of Chartreuse, I gave up my observation then and grabbed my camera to take a photograph which was done at the 200th of a second. A few moments later, the machine rose vertically, in a tremendous acceleration. It put approximately 6 to 7 seconds to disappear from our sight. According to my calculations, the diameter of the machine was approximately 80 meters (evaluated by comparative measurement); its distance to me was 2 kilometers; its altitude from 1.000 to 1.200 meters. Length of the trail: approximately 900 meters. Speed of the machine during its vertical rise: 7 times that of a supersonic plane." "It should be noted that it is precisely at the time of its strong deceleration that the long trail appeared!" "It should be noted that if this observation is so precise it is because the witness is a ufologist. It is Jacques Baccard, member of the C.I.E.O. and friend of Jimmy Guieu." Luc Chastan note comme sources "Les OVNI vus de près by Gross Patrick ** http://ufologie.net" and "Black-out sur les Soucoupes volantes by Guieu Jimmy ** Fleuve Noir 1956 omnium 1977". He published as small-size image of the photograph. REFERENCES: Harold T. Wilkins, Flying Saucers Uncensored (Citadel, 1955), plate. Jimmy Guieu, Black out sur les soucoupes volantes (Editions Fleuve Noir, 1956), pages 128-130 and plate 12. Gianfranco de Turris and Sebastiano Fusco, Obiettivo sugli UFO. Fotostoria dei Dischi Volanti (Edizioni Mediterranee, Rome, 1975), page 115. The website indicates that on 24 September 1954 at 13:10 in Grenoble, France "Photo of black disc or sphere. Left dark trail of smoke behind." And: "An object was observed and photographed. One black sphere was observed by one witness at a mountain for 30 seconds (Baccard)." The sources are indicated as Guieu, Jimmy, Flying Saucers Come from Another World, Citadel, New York, 1956; Vallee, Jacques, Computerized Catalog (N = 3073); Delaire, J. Bernard, UFO Register Volume 6 (1975), Data Research, Oxford, 1975; Hatch, Larry, *U* computer database, Author, Redwood City, 2002. References: Ouranos, 12, 4th Quarter 1954, page 10. Harold T. Wilkins, Flying Saucers Uncensored (Citadel, New York, 1955), plate. Jimmy Guieu, Black out sur les soucoupes volantes (Editions Fleuve Noir, 1956), pages 128-130 and plate 12. Gianfranco de Turris and Sebastiano Fusco, Obiettivo sugli UFO. Fotostoria dei Dischi Volanti (Edizioni Mediterranee, Rome, 1975), page 115. Patrick Gross, http://ufologie.net/1954/24sep1954grenoblef.htm [old URL of this page]. Probable fake. The UFO looks like an ink stain that has been wiped into a trace. [---] Article in the national newspaper Le Parisien Libéré, Paris, France, September 30, 1954. [---] Article in the weekly magazine Radar, Paris, France, October 31, 1954. [sm1] Article (part) in the Semaine du Monde magazine, France, November 5, 1954, transcription to English by Alexander B. Mebane, USA. [ou1] Report in the ufology magazine Ouranos, France, #12, page 10, 4th quarter 1954. [ou2] Ufology magazine Ouranos, France, #12, page 13, 4th quarter 1954. [hw1] "Flying Saucers Uncensored", book by Harold T. Wilkins, Pyramid Books publisher, 1954. [ou3] Ufology magazine Ouranos, France, #13, pp 25-26, 1st quarter 1955. [jg1] "Black-Out Sur Les Soucoupes Volantes", book by Jimmy Guieu, Fleuve Noir publihser, France, pp 128-130, 1956. [jg1] "Black-Out sur les Soucoupes Volantes", book by Jimmy Guieu, Omnium Littéraire publisher, France, pp 128-130, 1972. [---] "Obiettivo sugli UFO - Fotostoria dei Dischi Volanti", book by Gianfranco de Turris and Sebastiano Fusco, Méditerrannée publisher, page 115, 1975. [---] "UFO Register", compiled by J. Bernard Delaire, Data Research, U-K., 1975. [bd1] "The UFO Register - The Official Organ of Data Research Contact International (U.K.)", compiled by J. Bernard Delaire, Volume 6, Part 2, page 42, November 1975. [mj1] "Que devient BAVIC, ou la journée du 24 septembre 1954 revue et corrigée", article by Michel Jeantheau, in "Le dossier 1954 et l'imposture rationaliste", book by Jean Sider, Ramuel publishers, France, page 150, 1997. [jd1] Listing UFOTO, by Jean-Philippe Dain, France, circa 2002, on the web, disappeared. [bo1] "The Year 1954 in Photos", paper by Vicente-Juan Ballester-Olmos, Fondation Anomaly, Spain, 2004. 1.0 Patrick Gross February 10, 2010 Conversion from HTML to XHTML Strict. First formal version. Additions [go1], [lc1], [ud1]. 1.1 Patrick Gross February 27, 2017 Additions [er1], [ub1]. 1.2 Patrick Gross March 2, 2017 Addition [sm1]. 1.8 Patrick Gross April 20, 2018 Addition [bo2]. 1.9 Patrick Gross January 22, 2019 Additions [ou1], [ou2], [ou3], [lh1], [bd1]. This page was last updated on January 22, 2019.